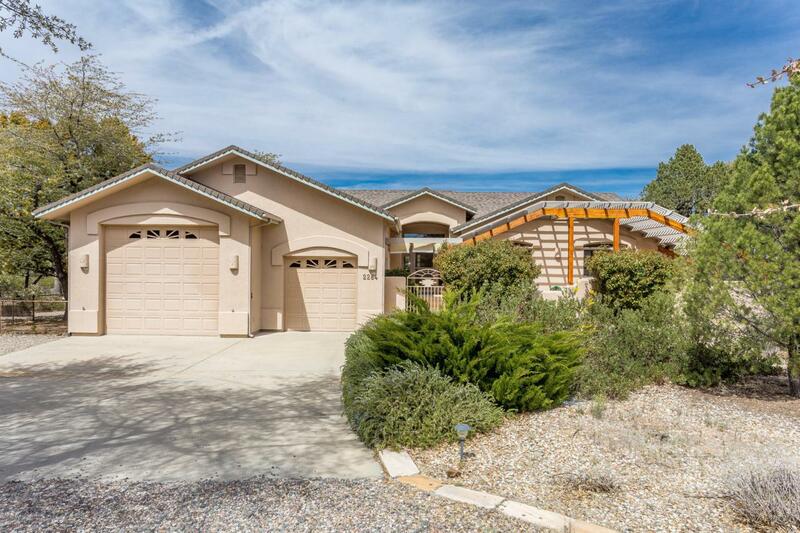 Welcome to Royal Oaks, one of Prescott's most highly sought after subdivisions located in Williamson Valley. This gorgeous SINGLE LEVEL home boasts outstanding curb appeal with an attached RV garage plus single additional bay, PLUS a detached 18'W x 24'D shop/garage! On approach you're greeted by a circular driveway as well as enclosed courtyard entry with aluminum pergola overhead creating an inviting entrance to the home. Inside you will find an open & spacious floor plan with vaulted ceilings, varying height pot/plant shelving throughout the home and lit art niche for added architectural appeal in living room along with floor to ceiling stacked stone fireplace. CONTINUE:Generous master suite offers private access to rear portion of large deck that is screened in, bathroom has dual & separate vanities, private water closet, large linen storage, & walk in shower. Kitchen has beautiful shaker style cabinetry, 4 burner gas cooktop, tile counters, abundant storage, wall oven, breakfast bar with lighting above it and adjacent dining area overlooking the backyard. Guest bedroom & den along with guest bath are spacious in size, and den easily converts to 3rd bedroom with quick addition of a closet. Additional features include extensive tile throughout the wet/traffic areas of the home with only carpet being in the 2 bedrooms, large pantry/utility room adjacent to kitchen has utility sink and added storage closet. Grounds are gorgeous & immaculately kept, with mature native trees & shrubs, fenced in rear yard and partial fencing around the perimeter plus storage shed. RV side of the attached garage has a 11.5' W x 12' T door and interior is a total of 34.5' deep with a curb stop at 27' and there is a workshop space at the rear, plus shop sink! Additional recent improvements include new HVAC & hot water heater in 2010 as well as Novo Water conditioning system installed in the home.